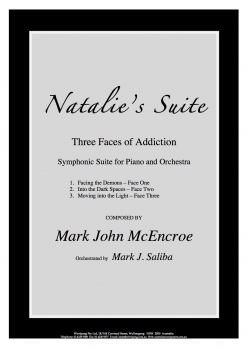 Natalie’s Suite - Conductor’s Score is a three-movement symphonic work composed by Australian composer Mark John McEncroe. The Suite focuses on the struggles and challenges of overcoming addiction and depression and is dedicated to McEncroe’s daughter who is wrestling with these issues, as her dad did several decades ago. The music is dark, very emotional, and extremely powerful. The Janacek Philharmonic Orchestra performed the first recorded version of this Suite in the Czech Republic in 2015, and the performance time on that album was about 50 minutes. 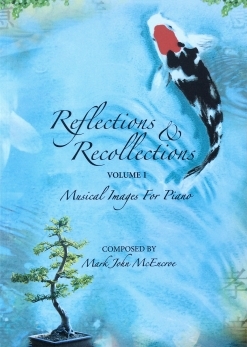 It is interesting to note that McEncroe describes the themes of the Suite as “grappling with an insane, detrimental cycle of repeating mistakes. “ He chose to illustrate this by keeping the entire work in the “home key,” which for the C instruments is C# minor. The instrumentation calls for piccolo, flutes 1 and 2, oboes 1 and 2, clarinets in A 1 and 2, bassoons, horns in F 1 and 2, timpani, violin 1, violin 2, viola, violoncello, and double bass. Although it isn’t included in this list, the piano has a rather large part in the Suite. The first movement is titled “Facing the Demons” and begins with a very dark and dramatic piano solo that sets the stage for what follows. When the orchestra enters, the tone of the music turns tragic. As the 21 1/2 minute movement unfolds, many emotions are expressed - some via the piano, but most by the orchestra. Some of these emotions are contrite and sad, some are big and turbulent, and some just feel lost. The second movement is titled “Into the Dark Spaces” and is also about 21 minutes in length. Even darker and more desperate than the first movement, it powerfully expresses McEncroe’s words: “There can be no recovery until acceptance of complete powerlessness is reached.” The third movement is called “Moving Into the Light.” Much shorter at seven minutes, it is far from joyful, but is moving in that direction with hope. 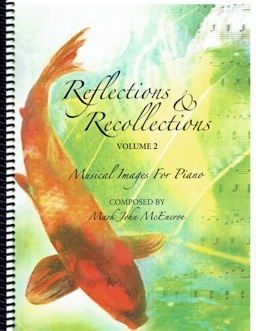 The Conductor’s Score for Natalie’s Suite is available from Wirripang Pty Ltd.